How do I Subscribe to NollyLand? 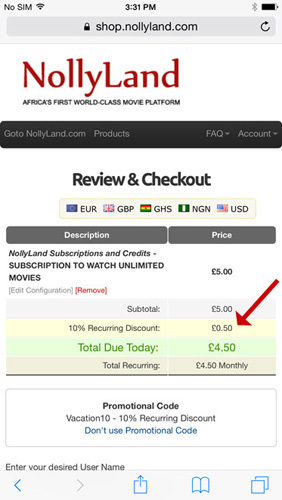 Purchasing a NollyLand Subscription is very easy. Please perform the following steps to place your order, make your payment, and activate your Subscription. Click on the "Order Now" button for the "SUBSCRIPTION TO WATCH UNLIMITED AND ALL MOVIES" option. Choose your billing cycle, "Monthly", "Quarterly", "Semi-Annually", or "Annually". Then, click on the "Add to Cart" button. Your shopping cart will be displayed. Click on the green "Check Out" button. Enter your contact details, choose your payment option, and fill in your payment information. Click on the "Complete Order" button. Your subscription will be immediately activated on successful payment. NollyLand accepts a wide range of payment options including Visa, MasterCard, Discover, American Express, Debit Card, JCB, PayPal, Payza, Bitcoin, Interswitch, Verve, Apple In-App Payment, Android In-App Payment, Roku In-Channel Payment, and Bank Transfer Payments to our GTBank, Zenith, and Eco bank accounts. We accept multiple currencies including USD, GBP, EURO, Naira, South African Rand, and Ghanaian Cedi. Please visit our Payment Options page for details. NollyLand Credits allow you to watch Premium and Individual movies. Visit www.nollyland.com to buy NollyLand Credits. How do I watch NollyLand Movies on my TV? For Xbox, Roku, Roku TV, Apple TV, Google TV, Android TV, and NollyLand Media Player, visit the App Store on your device, search for "NollyLand", and download the NollyLand App directly to your TV device. For Chromcast, install the NollyLand App on your Android device and cast to your Chromecast equiped TV. How do I Renew my NollyLand Subscription? If you subscribed using In-App Payment on iPhone/iPad, In-App Payment on Android, In-Channel Payment on Roku, Credit/Debit Card, or PayPal, your NollyLand Subscription will be automatically renewed. There is nothing for you do to. Pay your most recent pending invoice. Your NollyLand Subscription will be renewed after successful payment. You will then regain access to watch full-length movies. Choose your Billing Cycle, then tap or click the "Checkout" button. This will display your shopping cart. Below your shopping cart, enter the promotional code in the "Promotional Code" field. Next, tap or click on the "Apply Code" button to apply your code to your shopping cart. See screenshot below. The discount will be applied in your shopping cart. Please follow the instructions on the screen to complete and pay for your order. How do I use my In-App NollyLand Subscription, Day Pass, & Credits (Xbox, Roku, iPhone, iPad, Apple TV, Android, Windows 10 Mobile, Windows 10) on my other Devices? Yes, you can use your In-App NollyLand Subscription, Day Pass, & Credits that you purchased from inside Xbox, Roku, Roku TV, iPhone, iPad, Apple TV, Android, Windows 10 Mobile, and Windows 10 to watch full-length movies on your other devices. Please perform the following steps to achieve this goal. First, Sign up for a free NollyLand account. An email will be sent to you with your NollyLand User Name and Password. Next, go to your NollyLand App where you purchased your In-App NollyLand Subscription, Day Pass, or Credits, select the "Log In" option and enter your NollyLand User Name and Password. This will attach your In-App NollyLand Subscription, Day Pass, and Credits to your NollyLand Account. Finally, use the same NollyLand User Name and Password to "Log In" on the NollyLand App on your other devices. Your In-App NollyLand Subscription, Day Pass, and Credits will then be shared across your other devices. Can I use my NollyLand Subscription, Day Pass, and Credits on Multiple Devices? Yes, regardless of your method of purchase, you can use your NollyLand Subscription, Day Pass, and Credits to watch full-length movies concurrently on multiple devices including smartphones, tablets, game consoles, computers, and TVs. To use your NollyLand Subscription, Day Pass, and Credits on multiple devices, Sign Up, then select the "Log In" option inside the NollyLand App to sign into each of your devices. Your NollyLand Subscription, Day Pass, and Credits will be active on the devices where you signed in. No, there are no contracts. You may cancel your subscription any time. What Devices can I use to Watch NollyLand Movies? NollyLand has free Apps and supports the watching of movies on all major devices including smartphones, tablets, computers, directly on TVs, game consoles, and virtual reality. NollyLand provides free Apps for Xbox, Roku, Roku TV, iPhone, iPad, Apple TV, Android, Windows Phone, Windows Tablet, Windows Holographic (Oculus Rift), and BlackBerry. Also, our Android App can be used to cast NollyLand movies to your TV via Chromecast. The NollyLand Android App can be installed directly on Google TV, Android TV, and the NollyLand Media Player. Our Apple TV App can be installed directly on your Apple TV. Can I watch all Movies with my NollyLand Subscription or Day Pass? All movies except those designated with the Premium label are included in your Subscription or Day Pass. When you subscribe or buy a Day Pass, all movies except for Premium movies will become available to watch. How do I cancel my NollyLand Subscription? You can cancel your subscription depending on your method of purchase. 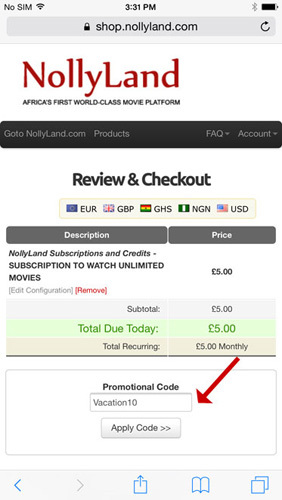 If you purchased your NollyLand Subscription from our website, you can log into your account at https://shop.nollyland.com to cancel your subscription. After logging in, select your service, then click on the "Request Cancelation" button to request for NollyLand to cancel your subscription. We will cancel your subscription within 24 hours. If you purchased your NollyLand Subscription via in-app payment (Roku, Android, iPhone, iPad, Apple TV, Xbox, or Windows 10) then please log into your account at Roku, Google, Apple, or Microsoft to cancel your subscription from there.